The Asian Financial Crisis: Causes, Contagion and Consequences (Global Economic Institutions) | Free eBooks Download - EBOOKEE! Posted on 2013-11-30, by nobihai. 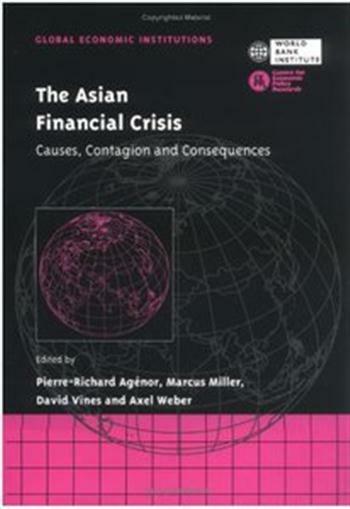 The Asian Financial Crisis: Causes, Contagion and Consequences (Global Economic Institutions) by Pierre-Richard Agénor, Marcus Miller, David Vines and Axel Weber English | January 28, 2000 | ISBN-10: 0521770807 | 448 pages | PDF | 3 Mb The first theoretical analysis of the Asian Financial Crisis--perhaps the single most important economic event of the 1990s--starts by presenting a factual and analytic overview of what happened. It goes on to consider why crisis turned into collapse, speculative attacks, and contagion and finishes with a round table discussion of policy issues. The distinguished contributors are from organizations including IMF, the World Bank and the Bank for International Settlements. This is vital reading for policy professionals as well as researchers and graduate students in a wide range of disciplines. No comments for "The Asian Financial Crisis: Causes, Contagion and Consequences (Global Economic Institutions)".